Digital cameras have a well-earned reputation as some of the most fragile gadgets you can buy. Screens crack, buttons fall off, lenses grind to a halt and just a few drops of water can kill one deader than disco. We've seen some toughened cameras in the past, but none have offered more than basic dust- and waterproofing - until now. 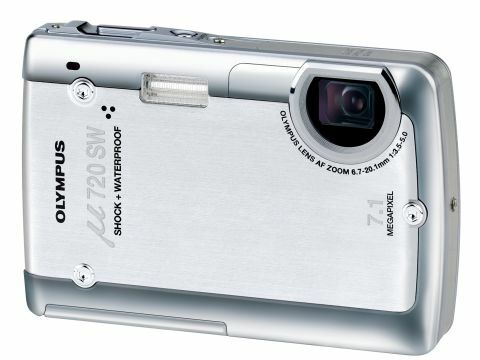 The 720SW claims to be waterproof to a depth of three metres, and shockproof when dropped from a height of 1.5 metres. It certainly looks the part, with an all-metal case that's liberally festooned with solid metal details, chunky rivets and exposed screws. Latched ports give access to the battery and memory card, and a single jack cleverly combines power, video and USB functions. Many of the controls, including the power button, are on the small side, which may cause problems with gloves or wetsuits, and you'll have to watch for fingers straying in front of the corner-mounted internally-zooming 3x lens. This zooms without noise but has just ten discrete focal lengths, and quite a large step between the two widest-angle settings. The shutter's also hesitant while locking on. Around the back, a layer of polycarbonate, which, surprisingly, doesn't affect its clarity or brightness at all, protects the 2.5-inch screen. It's not stupendously sharp, but it works OK in daylight and it's good in dim conditions. The Olympus menu screen was never the easiest to use, so it's good to see that the interface has evolved. It now has a left-hand quick menu giving access to basic ISO, white balance, drive and metering modes, although not image size and quality. The target audience for the 720SW is more extreme sports than extreme photography, and there are few creative features here. Scene modes include four useful underwater settings (two requiring the optional 40m housing for deep diving), a couple of shoot-and-select high-speed modes and an Auction mode for taking pictures of old cameras destined for eBay. Basic spot metering and focusing are also on board, but that's about it. Like many other manufacturers (most impressively, Fujifilm), Olympus is chasing the low-light market. As well as the fantastic Bright Capture LCD, there are ISO settings up to 1600, and even as high as 2500 if you don't mind losing resolution. Predictably, images are noisy and lack detail at 2500, but at least it's there if you need it. The on-board flash could do with firing a few more photons, but exposure's smooth and well judged. So how tough is the 720SW? Three-metre waterproofing is perfect for splashing about on the beach and for most snorkelling. We recommend using the Underwater mode to lock the focus - the AF takes ages to lock on beneath the waves. Image colours are powerful without being aggressive, and they're the 720SW's strongest point - especially the way even, natural skin tones are captured. Exposure's also very good - all our test images, ranging from night-time portraits to underwater macro, benefited from reliable metering. The folded optics are typical of the cheaper end of the market, showing distortion, nasty purple fringing and some softness towards the edge of the frame. Unfortunately, what detail the 3x lens does capture is squandered by hefty in-camera processing that reduces it to mush, occasionally adding jaggies too.